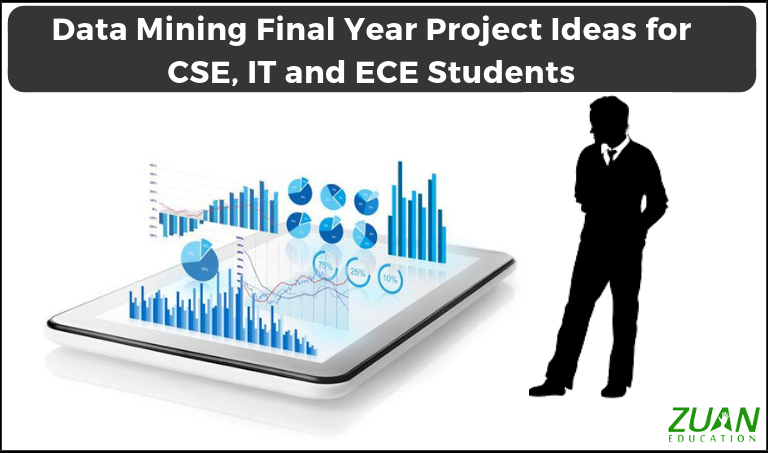 Data Mining final year project ideas to nurture your creative innovation. But before that here is something to boost your spirits. Does the idea of doing a project upset you mentally and make you sad? If so, why? You need not feel that way. First, sort out a good company where you can do your project. I would suggest you look out for a startup. Because they will guide you superbly. Furthermore, select a crazy and cool friend to roam around with you while searching for such companies or startups. Have him/her with you until the project is over. It will be good if you share all project ideas with your friend or peer in a restaurant, park, beach, in the woods etc. I mean staying relaxed will help you get more ideas for the project. Search for previous similar or related research on the topic. Befriend a final year passout who has experience in doing a project. Ask him/her for workable data mining project ideas. Select real time and future-applicable data mining project topics. Make it more practical and interesting. Since it is your first research experience don’t choose complicated project titles. Now folks, let us look briefly into some data mining final year project ideas. This is classic among the data mining final year project ideas. The aim of the project is to predict weather. In this project you mention various techniques and algorithms pertained to weather prediction. You also analyze the performance of these algorithms. Moreover, you also discuss other ensemble techniques used to boost the performance of the application. The findings of the research will be unique. After you compare the data mining algorithms and corresponding ensemble techniques, a classifier to predict the weather is obtained. Furthermore, in the application part, you notify that the method is used to forecast weather based on pre-historical data. This helps to save resources and prepare for the forthcoming changes. This is yet another timely suggestion among the data mining final year project ideas. Online buying habit is booming in India. Uniquely, you can analyze the consumer’s behavior in online shopping. For this you need to cull out detailed information on consumer’s past purchases and prediction of future purchases. Correspondingly, data mining can be used to collect such hidden data. You call this as data analysis, knowledge discovery and deductive learning. In this project, you can build a road-map for analyzing consumer’s online buying behavior with data mining. Therefore, this project aims to understand the role of data mining in the growth of online shopping. Furthermore, you will also analyze the consumer online buying behavior towards online shopping. By this you help the retailers to design appropriate strategies for selling their products online. This could be very valuable among the data mining final year project ideas. Because there are increasing ATM and debit/credit card thefts. In fraud detection you define the skilled impostor and formalize the key forms and sub forms of recognized frauds. Eventually, you reveal the nature of the gathered data. In this paper, you talk of the preferred data mining techniques. Furthermore, you also highlight the mannered way in which frauds can be analyzed. Significantly, your research describes different types of frauds. And their detection through data mining terminologies. Eventually, you give a direction by which detection can be moved in a simplified way. Therefore, the theme of your research will be two things. One, to identify the type of fraud patterns using data mining techniques. Second, to resolve the criminal aspect in a simplified way. Surely, yet another cool suggestion among the data mining final year project ideas. Your affordability to use social media has expanded due to fast internet connectivity and web 2.0 technologies. You rely on social media (SM) to gain ideas and suggestions. Furthermore, it is essential to translate the sentiment expressed by SM users to useful information. This is done with the help of data mining techniques. Using data mining you can research three things on SM. They are, noise, size and dynamism. In this project you can review the current data mining techniques used to analyze SM. Moreover, you can further explore other data mining techniques that can be employed in the field. We are living in a world of increased shopping culture. You need know what people buy? And When they buy? So this discussion will be significant among the data mining final year project ideas. Transactional data in the retail market is maintained by the bill information given to consumers. In this data you also find facts regarding the date and time for any particular transaction. The goal of your project will be to mine the retail transaction data to find different facts that are season oriented. Like Winter, Summer, and Monsoon. For this, you have to identify frequent item sets. This identification is done using classification and association techniques of data mining. The results got from your research will be helpful to predict consumer behavior. And also to identify product buying patterns in various seasons. You can do research related to data mining even in various cloud computing based systems and employ various predictive modeling. Other data mining metrics involve, market basket analysis and data sets revealing various sentimental analysis. Your project research and suggestions using these various computer science methodologies will help in nation-building. As I pointed out earlier, come up with a particular exciting topic where you can show your creativity and innovation.